LEFT:Britain’s Got Talent judge Simon Cowell. RIGHT: Sarah Ikumu, a 16 year-old British-born Kenyan teen. 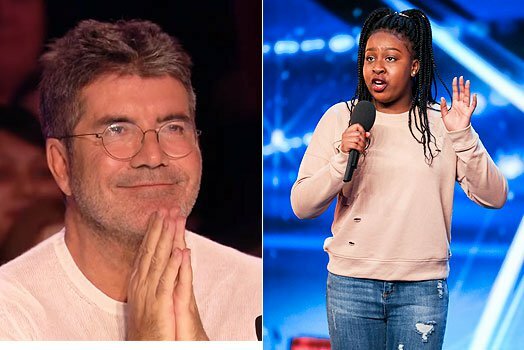 Sarah Ikumu, a 16 year-old British-born Kenyan teen, on Saturday got a standing ovation and impressed judge Simon Cowell during the season premiere of Britain’s Got Talent. Her performance earned her the first golden buzzer for her performance on the show, which means she will now go straight to the live shows. Ikumu, whose parents are Kenyan immigrants, performed a show-stopping rendition of And I Am Telling You by Jennifer Hudson. She left everyone in London’s Palladium theatre and those who watched at home star struck. She belted out the song leaving the audience gasping and wondering what happened to the shy school girl who just a few moments before walked on to the stage. When asked by Simon why she choose the song, Sarah explained she picked the song ‘because it shows my vocal ability the best’. Of course she brought the house down, and the crowd and judges were on their feet applauding her when she finished. ‘Sarah I’ve heard this song a lot. You started off well…and then it’s like you became possessed halfway through. It was quite incredible,” said Simon Cowell. Ikumu was born in Milton Keynes and started singing from an early age of 5. When her parents relocated back to Kenya for about two and a half years, she attended Riara Springs Primary school which is situated at Imara Daima off Mombasa Road where she continued singing. TEEN WITH KENYAN ROOTS DAZZLES AT BRITAIN’S GOT TALENT 2017 – VIDEO Reviewed by samrack on April 16, 2017 .